Arbor Day Hazelnut is a variety of nut tree that is formed by crossing of two tree varieties of North America, Beaked and American, and the European variety Hazel. This tree breed produces sweet, delicious nuts in approximately four to five years of growth. A well-established Arbor Day Hazelnut tree is capable of yielding a maximum of seven pounds of nuts. These plants grow well in a sunny region with sufficient space for two to three bushes to assist to guarantee cross pollination by the wind. These shrubs perform well in almost all kinds of soils, but they mostly prefer acidic to neutral soils, wet and well drained soils. However, the Arbor Day Hazelnut variety does not prefer heavy clay, low hardpan, or swampy soils. The Arbor Day Hazelnut tree is capable of attaining the maximum height of 15 feet, and the maximum spread of 10 feet, with profound, fibrous roots. These tree breeds have a growth rate of medium to fast that performs well in full sun. 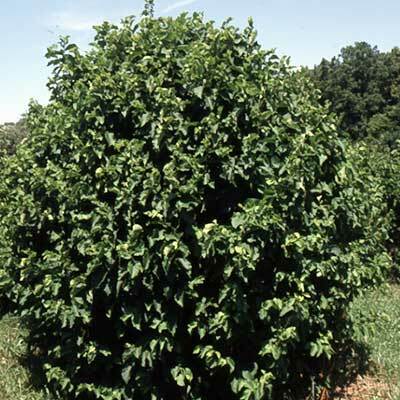 When fully grown, the Arbor Day Hazelnut tree attains a circular shape with widespread branches. The leaves of the tree are alternate, and they attain a length, ranging from 2.5 inches to 6 inches. The leaves of the tree are spherical, heart-shaped at the bottom and their tip attains the shape of a spear, with doubly-toothed borders. The leaves are dark green in color on top, lighter green color at their lower part, with some malleable hairs. The tree produces flowers in late summer, and the size of the flowers ranges from 1.5 inches to 2.5 inches. The female flowers assume the red color and the male flowers are green in color, turning typically tan. The Arbor Day Hazelnut tree produces bunches of fruits, typically a maximum of four fruits per bunch. The fruits of the tree are brown to chestnut brown in color and they attain a diameter, ranging from 0.25 inches to 0.75 inches when ripened. The fruits are enclosed in furry, leaf-like shells with ragged rims known as involucres. The green involucres dried up and turn out to be brown and crunchy during the time of harvest. The nuts of the Arbor Day Hazelnut tree are a preferred food for squirrels, wild turkeys, deer, pheasants, blue jays, grouse, and other mammals. The shrubs offer nesting and cover for several mammals and birds. Bats make use of hazel bushes for day resting. The average lifespan of the Arbor Day Hazelnut tree ranges from 30 years to 35 years.